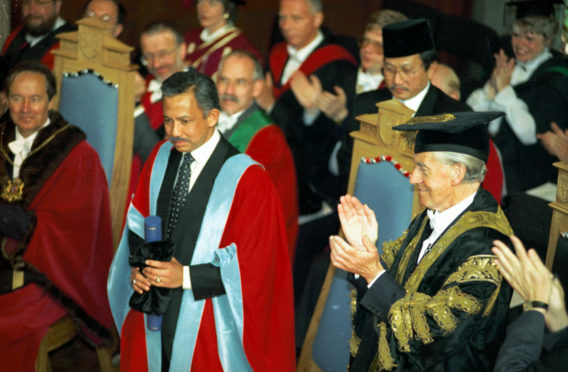 The Sultan of Brunei, receives an Honorary Doctor of Law degree at an Aberdeen University graduation ceremony in 1995. Following calls for Aberdeen University to revoke its honorary degree from the Sultan of Brunei, another organisation is considering a similar action. The Royal College of General Practitioners (RCGP) has said its fellowship and awards committee has unanimously recommended that Hassanal Bolkiah’s Companion of the College title is withdrawn. Last week the 72-year-old imposed strict new laws punishing homosexuals with death by stoning. He also introduced rules sentencing lesbians to “40 strokes of the cane” or 10 years in jail, while people found guilty of theft could now have their limbs amputated. Following this, hundreds of students, lecturers and members of staff at Aberdeen University signed a petition calling for the honorary degree the Sultan was awarded in 1995 to be removed. The organisation’s Senate will vote on the matter at its next meeting. Last night, the RCGP announced it will be convening an extraordinary meeting of its trustee board next week to strip Bolkiah of the ceremonial title it previously bestowed upon him. Chairwoman, Professor Helen Stokes-Lampard, said: “We fully understand that our members want rapid action and a clear decision on this and we are working as fast as we practically can to deliver this. “The fact that we are calling an extraordinary meeting of our trustee board shows the level of our concern on this issue.